Two Bandit Thieves can be found at Four Skull Lookout as part of the Divine Crusader Creation. They have stolen the Crusader's Relics and must be killed during the related quest. 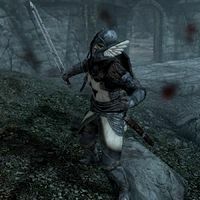 This Bandit Thief wears the Boots of the Crusader, Cuirass of the Crusader, Gauntlets of the Crusader, and Helm of the Crusader. He wields the Mace of the Crusader and Shield of the Crusader in combat. Additionally, he carries a small amount of gold. 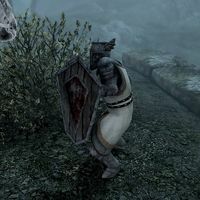 This Bandit Thief wears the Fastened Shield of the Crusader, Reforged Boots of the Crusader, Reforged Cuirass of the Crusader, Reforged Gauntlets of the Crusader, and Reforged Helm of the Crusader. She wields the Sword of the Crusader in combat.